Dutch death metal band Bodyfarm signed a deal with Cyclone Empire. 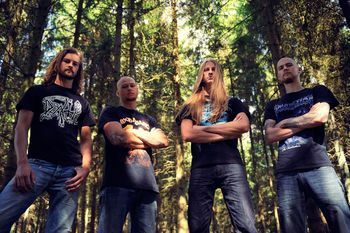 The band's full-length debut, Malevolence, was due the autumn of 2012. The Utrecht-based death black metal band was formed in 2009. The Bodyfarm demo was issued in 2010. Quint and Thomas comprised the line-up on that release. In 2015, the Dutch death metal band was in the midst of pre-production for the follow-up to its 2013 album, The Coming Scourge. In addition, the band parted ways with bassist Harry Van Breda on good terms. He was replaced by Alex Seegers (ex-Pleurisy). The still untitled new album is due to be released in the autumn of 2015 again through Cyclone Empire Records. The band would release its next album, Battle Breed, on November 6th, 2015 through Cyclone Empire Records. The follow-up to 2013's The Coming Scourge was mixed and produced by Ronnie Björnström. Alex Seegers was now on bass.